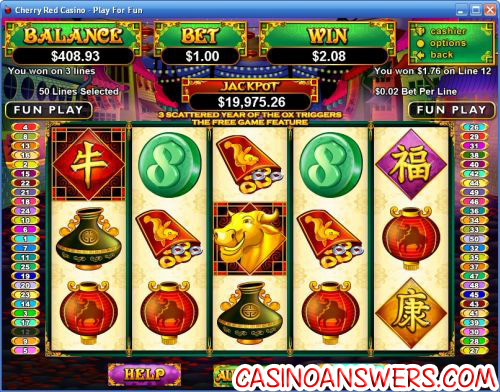 Happy Golden Ox of Happiness Video Slot Guide & Review - Casino Answers! Happy Golden Ox of Happiness is a 5-reel, 50-line video slot developed by RTG, featuring wild substitutes, scatter wins, multipliers, a re-spin feature, a free spins feature and a progressive jackpot. You can play the Happy Golden Ox of Happiness video slot at US-friendly casinos Lucky Red Casino and Slots Oasis Casino. Happy Golden Ox of Happiness is a fixed bet slot machine. All bets are $0.02 per line on all 50 paylines, thus every spin you make is $1. This is great for all types of players who are looking to win its progressive jackpot. To play Happy Golden of Ox of Happiness, you just have to hit the “Spin” button and the reels will spin. You can hit “Stop” during a spin to use the skill stop feature. Also, if you wish to speed up gameplay, hit the “Options” button and turn “Turbo Play” on. 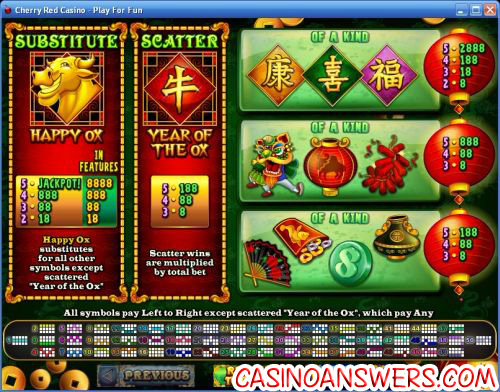 To win the Happy Golden Ox of Happiness’ progressive jackpot, you must line up five Happy Ox symbols during the regular slot game (not during a feature). The Progressive Jackpot cannot be won from the re-spin or free game features. Progressive Jackpot wins are added to other wins in the game. At the time of this writing, the Happy Ox progressive jackpot was at $20,000 and ready to be won at any time! The Happy Ox symbol will not only trigger the progressive jackpot, but the 8888 coin top fixed jackpot as well during one of the slot’s features. If you know anything about the Chinese culture, you might know that the number 8 is their lucky number. The Happy Ox symbol is the wild symbol. It will substitute for all other symbols except for the Year of the Ox scatter symbol. When the Happy Ox symbol appears on both reels 1 and 5 at the same time, you will trigger the re-spin feature. The two reels will be held while the other three reels will spin up to 8 times. Prizes during the re-spin feature are multiplied by 1 in the first re-spin, 2 in the second re-spin, 3 in the third and so on.. Neither feature can be triggered during re-spins. The Progressive Jackpot cannot be won during the re-spin feature. During the re-spins, 5 Happy Ox symbols on a payline will pay 8888X the bet per line, multiplied by the current re-spin prize multiplier. When three or more Year of the Ox scatter symbols appear anywhere on the reels of Happy Golden Ox of Happiness, you will trigger 8 free spins with a 3X multiplier. All prizes will be tripled except for re-spin feature prizes. Prizes during re-spins won during the free spins feature are multiplied by 3 in the first re-spin, 4 in the second, 5 in the third, etc. You can re-trigger the free spins feature. The Progressive Jackpot cannot be triggered in the free spins feature. During the free spins feature, when you hit 5 Happy Ox wild symbols on a payline, you will win 8888X your line bet, multiplied by the applicable prize multiplier. Wins on different paylines are added. All spins on the Happy Golden Ox of Happiness Real-Series Video Slot are with all 50 lines selected at $0.02 per bet line. Scatter wins are added to payline wins. Scatter wins are multiplied by the total bet. Payline wins are multiplied by the bet per line, except for the Progressive Jackpot. Only the highest win on each payline is paid out. The maximum win per paid spin is 50,000X bet per line (except Progressive Jackpot). The Happy Golden Ox of Happiness slot machine has an autoplay mode where you can set the number of spins (5, 10, 25, 50, 250, 500 and 1000), to stop when jackpot is won, stop if a win exceeds or equals (up to $99,999), stop on any win, stop if your balance increases by (up to $99,999), stop if your balance decreases by (up to $99,999) and stop once feature is triggered. You can cancel autoplay at any time by using the “Stop Auto” button. Happy Golden Ox of Happiness is an inexpensive game with a chance to win some big money, which is always good. It’s also nice to have a couple of special features thrown in there as well. One of the best casinos to play the Happy Golden Ox of Happiness video slot game at is Lucky Red Casino, where you can get a 400% up to $4000 signup bonus. To try and win the progressive jackpot on Happy Golden Ox for only $1 per spin, visit Lucky Red Casino! Are USA players able to play Happy Golden Ox for real money? Yes, American players can play the Happy Golden Ox of Happiness slot for real money at Lucky Red Casino, Slots Oasis Casino or their choice of Realtime Gaming casino. For more details on Slots Oasis, please read our Slots Oasis Casino Review. How do I win the progressive jackpot on Happy Ox? You can win the Happy Golden Ox of Happiness Progressive Jackpot by hitting five Happy Ox symbols on a payline. It has to be during the regular slot game and not during one of the features on Happy Golden Ox of Happiness. What features does Happy Golden Ox have? Happy Golden Ox of Happiness has a progressive jackpot, a re-spin feature with multipliers and a free spins feature with multipliers. How do I change my bet on the Happy Ox slot machine? You can’t. Happy Golden Ox of Happiness is a fixed bet video slot. All spins on Happy Ox will cost $1, which makes Happy Golden Ox of Happiness a great slot for casual slots players and low-risk gamblers. Here comes the Happy Golden Ox of Happiness?